How do I run an invoice for a single matter? 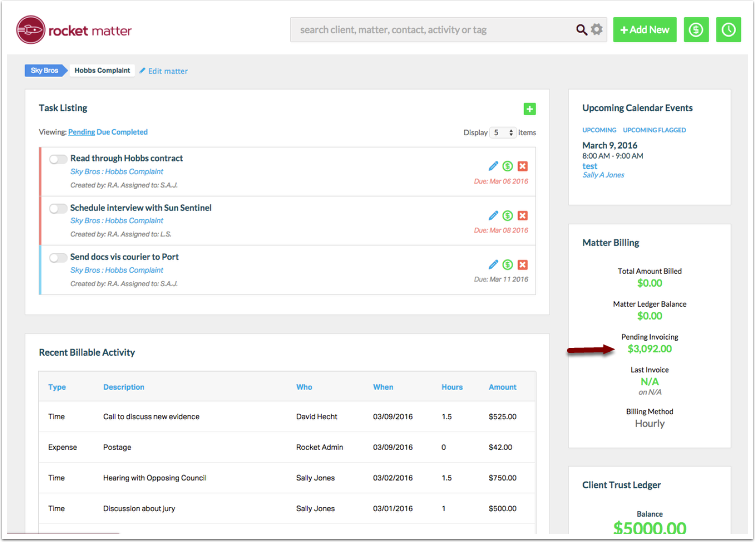 Rocket Matter Knowledge Base Trust Accounting How to run an invoice for one matter and apply trust funds. 1. Navigate to the matter. Click on the 'Pending Invoicing' amount. 2. Select time frame and filters. Click 'Get Answer' and then click 'Invoice'. Note: To edit billable entries prior to running an invoice, click the blue description text. This will take you into edit mode, where you can edit your entry. For a quick edit, click the Pencil icon to the right of the item and selct the green check mark when you're finished. 3. Select 'Invoice', and choose your file format. Click 'Next'. Zoom: 3. Select 'Invoice', and choose your file format. Click 'Next'. Note: If this is the first time you are running an invoice, we recommend that you select 'Pre-bill'. A 'Pre-bill' is like a print preview; It allows you to view the invoice without affecting your ledger balance. 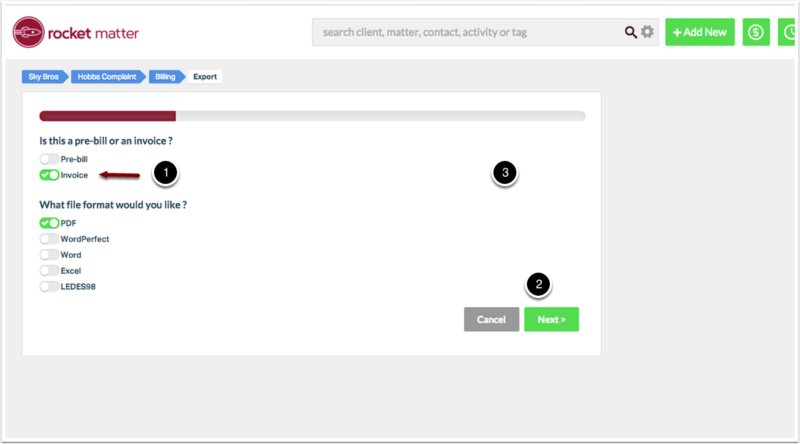 This allows you to review your invoice for errors before you run an invoice. When you run an invoice a debit is created in the matter ledger. 4. Choose how you would like available trust funds to be applied to the invoice. Click 'Next'. Yes transfer toward unpaid invoice(s): Transfer all indicated funds towards the invoice. Trust and operating ledger will relfect this change. No, but reserve these funds for transfer from another trust account later: Reserve these funds for later transfer. You'll need to click 'confirm' on the trust ledger when you're ready for these to be applied. No, don't do anything. I'll manage manually: Don't move any trust funds. Zoom: 4. Choose how you would like available trust funds to be applied to the invoice. Click 'Next'. 5. Confirm that you want to run the invoice. Click ''Process Invoice(s)". "Process Invoice(s)" will trigger the creation of your invoice. A debit will be created in your Matter Ledger, and a copy of your invoice will be stored in Matter Documents. 6. Click on the invoice to download. Zoom: 6. Click on the invoice to download. 7. Locate the invoice in your downloads folder. Open and review your invoice. 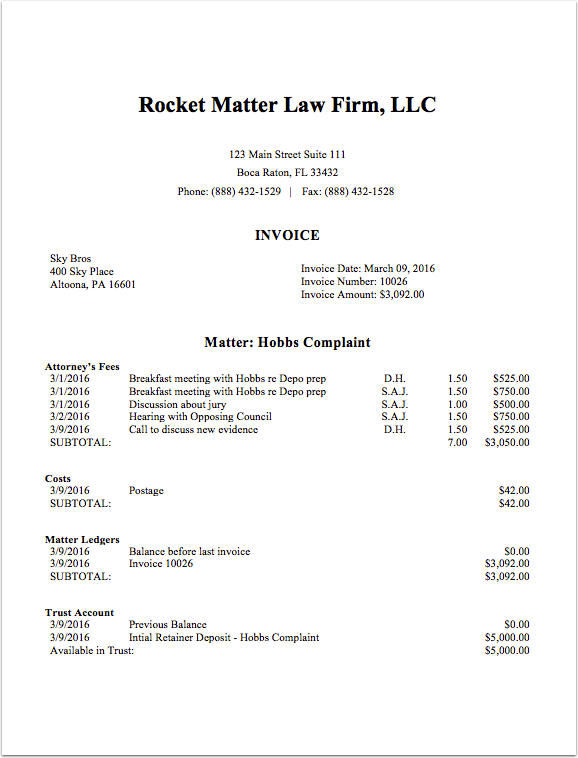 Note: Rocket Matter will use a default, generic Invoice Template to generate your invoice. 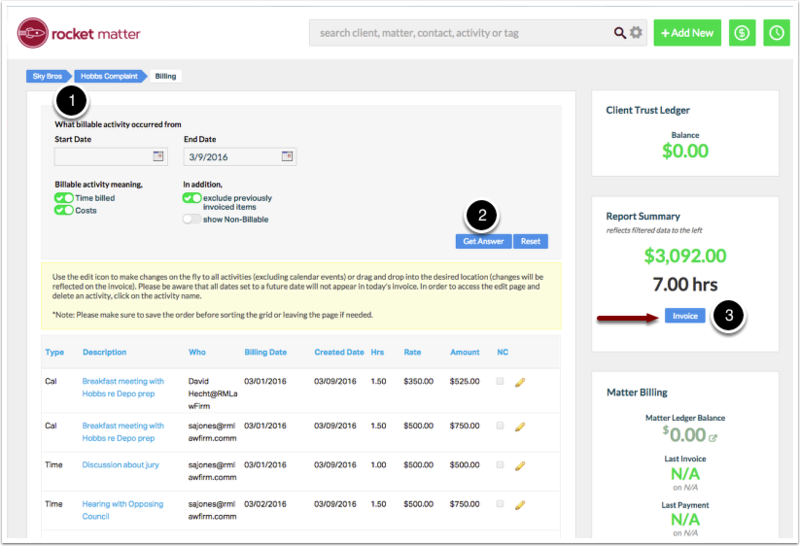 You can also upload a different Invoice Template. Invoice Templates are completely customizable with your firm's logo, fonts and content. Your invoice can be printed and sent to your client, e-mailed to your client, or it can be shared with your client via the Client Portal. Prev: How to add a payment to trust. Next: How to make an adjustment to a clients trust ledger.